Dominika Zareba – author of Poland’s first book dedicated to ecotourism (“Ekoturystyka”, PWN, 3rd ed. 2010). 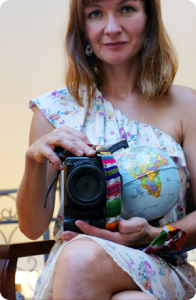 Writer, freelance columnist and traveler, author of tourist guides and books. Co-founder of the Bezdroża Publishing House. She laid the foundations for the greenways program in Poland and initiated creation of greenway networks across Central and Eastern Europe. She is active with many environmental NGOs in Poland and world-wide. Dominika is the Chief of the Board of Trustees of the Partnership Fund and the international expert of the Environmental Partnership Association which brings together six foundations running programs in Poland, the Czech Republic, Slovakia, Hungary, Romania and Bulgaria (www.environmentalpartnership.org). How do women leaders support ecotourism development in rural areas? I work mostly with the analog photography and write, trying to combine Image & Word to express the diversity of the world in which we can still find beauty, mystery, and harmony. My homeland is Central Europe, my hometown – Krakow, a mystical and artistic city. My work was exposed in dozens of books and publications, art exhibitions, galleries and cafes. 2012: Distinction in the international photo-contest „Exposure” and publication n the Exposure 2012 Catalogue published in N.Y.
2013: Distinction in the international photo-contest Exposure – See Me and presentation of photos on the Exposure 2013 exhibition in Long Island, N.Y.